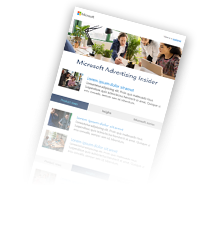 Bing Ads has evolved the performance reporting experience with the Performance Targets feature. Find out how these enhancements—powered by artificial intelligence (AI)—can help you with forecasting and tracking your results. Learn how to create and schedule a series of insertion orders that automatically renew according to a set frequency. Two new bid strategies have been added to our automated bidding family. Target Cost Per Acquisition (CPA) and Maximize Conversions. These goal-based bid strategies can help you achieve greater business impact while reducing the overhead of managing bids across all your keywords.